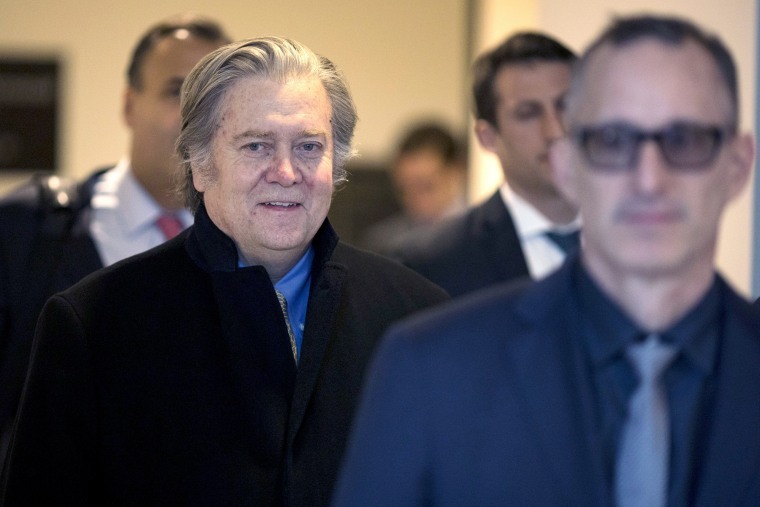 WASHINGTON — Steve Bannon, who served as President Donald Trump’s chief strategist, was interviewed by special counsel Robert Mueller over multiple days this week, NBC News has learned from two sources familiar with the proceedings. Bannon spent a total of some 20 hours in conversations with the team led by Mueller, who is investigating possible collusion between the Trump campaign and Russia as well as other issues that have arisen around the probe. Bannon left his job as a senior White House adviser in August and returned to a leadership role at Breitbart, the right-wing news site based out of Washington. But he fell out of favor with the site’s financial backers, the Mercer family, after criticizing the president and his family in "Fire and Fury,” a book about the Trump administration published earlier this year by author Michael Wolff. After a more than four-week stalemate, Bannon also returned to Capitol Hill Thursday to resume his interview with the House Intelligence Committee, which was halted when he earlier refused to answer key questions in the Russia probe. He left today after four hours, answering little more than the two dozen questions that the White House had negotiated with the House’s lead counsel. The committee had issued a subpoena in their initial Jan. 16 interview when Bannon would not address issues that arose during his time on the Trump transition team, in the White House and after he left his top position there. The subpoena deadline was postponed three times as House lawyers negotiated with the White House over what Bannon would be willing to discuss without the White House invoking executive privilege to bar the testimony. Lawmakers indicated Thursday that his continued non-cooperation might require the committee to take the next step and consider beginning the process of holding Bannon in contempt of Congress. Rep. Mike Conaway of Texas, the lead Republican on the committee’s Russia probe, said he would work with House Speaker Paul Ryan and House lawyers to further probe the executive privilege claims made Thursday and determine whether contempt proceedings were appropriate. Alex Moe and Mike Memoli contributed.